April has been a busy month for St Radegund. On Easter Saturday, the Annual Radegund Mile, with the course marked by our unique furlong markers, proceeded according to plan, with a total of 39 entries racing in two divisions. The post race beer and barbeque at City Boathouse was enjoyed by many of the competitors. City M 8@8, who won the St Radegund Cup for the fastest men's crew starting at our new start post, which was made by George Dickson and painted by Kelly Dickson. St Radegund W1 won their category (WMas) at the Head of the Cam on 26th April. This crew also raced in the Vesta Vets Head on 30th March, coming a very creditable 13th out of 22 WMasC crews. City of Cambridge Rowing Club won the St Radegund Cup on the River Cam. 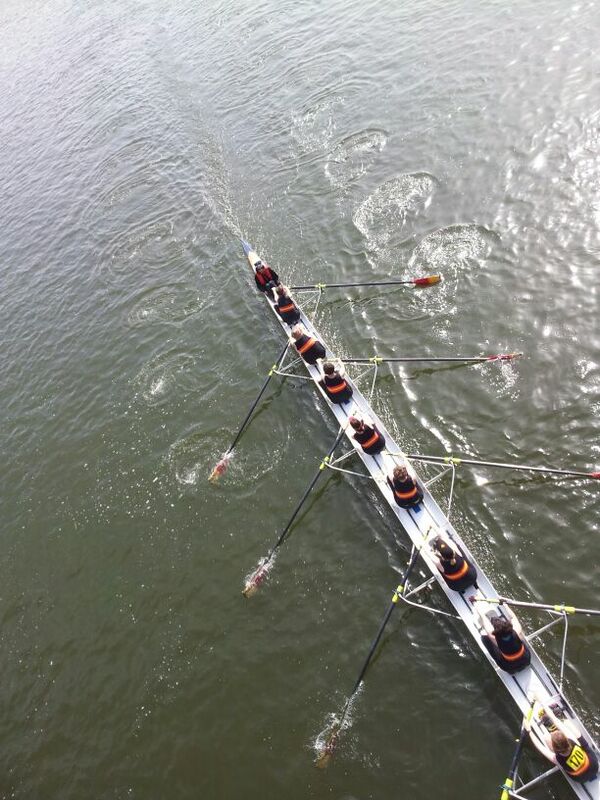 The annual Radegund Mile Race is for four and eight-oared boats, with the 39 crews split into two divisions. City of Cambridge’s Masters B 8+, 8@8, won the cup for the men’s fastest crew with an adjusted time of 5min 36sec. And the winner of the shield for the fastest women’s crew was Newnham College’s Division Two May Bumps crew Lady G.
A unique aspect of the Radegund Mile is that all crews are invited to predict their time over the course, and this year a Cantabrigian Rowing Club Men’s 4+, InVeterEight, won the prize, being only two seconds slower than their prediction. After some redevelopment the CRA have now launched their new website. Whilst many members of the club raced on the Cam, Sarah Airey, Alan Marron and Ben Redman raced the Scullers Head on the Tideway on Saturday 16th November. Sarah Airey added to her previous successes by winning the W IM3 1x category in a time of 23:42.66, finishing as the 11th fastest women over all. Ben Redman finished 3rd in IM1 Lwt 1x and Alan finished 4th in MasA 1x.